My name is Christine Deponio. At the age of 16 my life was turned upside down when I suddenly tragically went blind. Despite my disability I was determined to prove beyond measure that everything is possible. At the age of 25 I was the first person to receive the Wilkinson Sword Award for outstanding achievement in sport and today is still the only woman in 34 years to have ever received it. This was only the beginning for me, I was not going to let my disability rule my life. We are building up to our annual fundraiser on the 1st December. 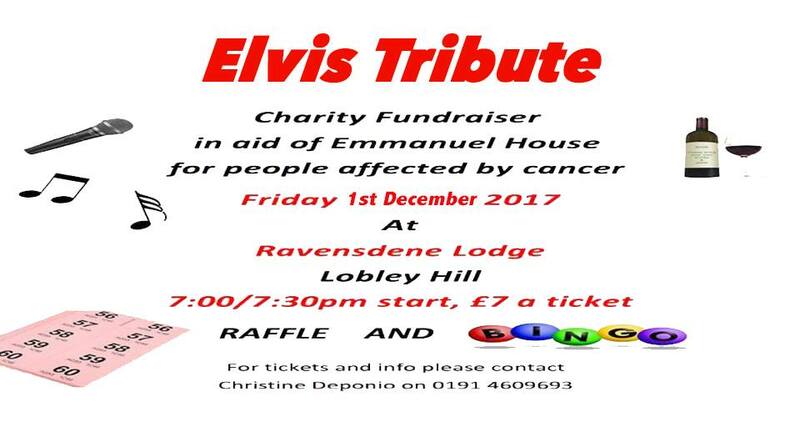 It promises to be a great night out with some excellent Elvis themed entertainment and we are just looking forward to the big day and seeing everyone. We depend on the fundraisers to maintain the holiday homes and Emmanuel House. 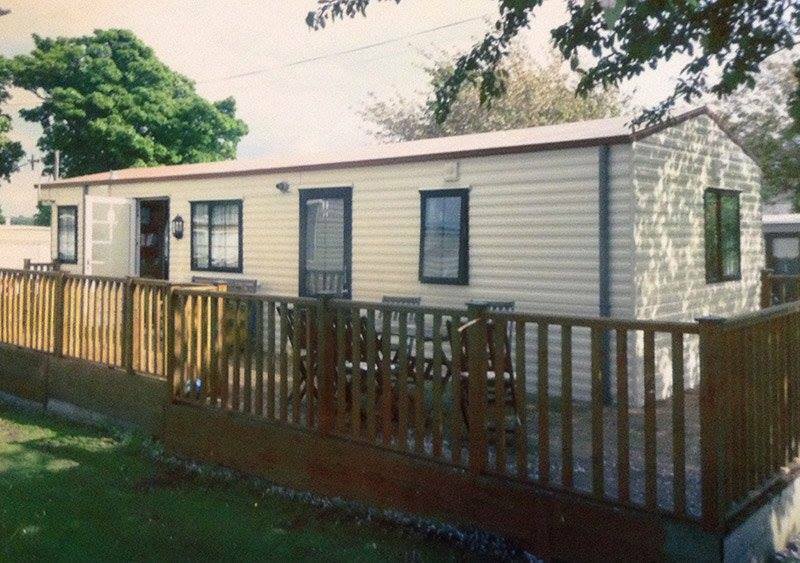 In 2006 we purchased three holiday homes at Cragside caravan park in Weardale. These we kitted out especially so cancer patients, the terminally ill and their families can go for respite care, completely free of charge. We've had many people stay after being referred by Macmillan nurses over the years. Unfortunately for some it is the last holiday they spend together but at least they have wonderful memories to cherish and look back on! This is run alongside Emmanuel House, Gateshead's free holistic therapy and drop in centre. A place for anyone to drop in and talk, share and relax. We always have a great laugh at our fundraisers and this time is no exception! We have a fab Elvis tribute act booked to keep us entertained. We have prize raffles, bingo and much more! Our event is held at Ravensdene Lodge in Lobley Hill on Friday 1st December 2017. Doors open at 7.00pm. We had an absolutely amazing night at our fundraiser on the 22nd September. I'd like to say a huge thank you to everyone for coming and giving so generously. I'd also like to thank Miss Hollywood for keeping us all entertained and the Ravensdene Lodge for doing such a great job putting on our event. It was a brilliant night and we had 127 guests of who commented that they all had a wonderful time and are looking forward to the next event. Unfortunately Raymond could not make it due to ill health but my son Ryan came along for support and also manned the camera for the night. He did a great job and was such a help. Altogether we raised the fantastic sum of £1,351.00 which was totally overwhelming, I can’t express enough how grateful I am for everyone’s support not just from those who attended but also those who couldn’t make it on the night and still kindly made donations towards the evening. The money raised will be going towards the running costs of the three Emmanuel House Holiday Homes will that we have purchased up in Weardale where cancer sufferers, the terminally ill and their families can go to for respite care completely free of charge. 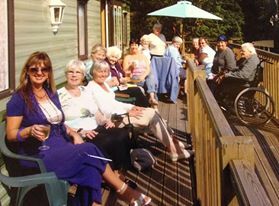 Once again many cancer patients and their families have been away to our holiday homes this year and have all had the most marvellous time. It was great to see so many familiar faces and catch up with everyone. Miss Hollywood was a super star as always and had the crowd dancing and singing along. I will be organising another event for a later date and will keep you all informed of the details. So thank you once again for your help and support over the years as I really do appreciate it. We always have a great laugh at our fundraisers and this time is no exception! 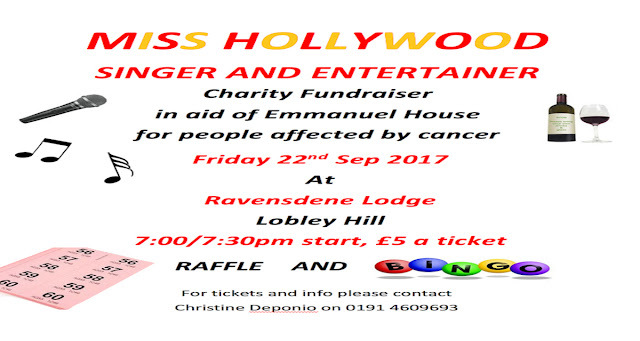 We have Miss Hollywood booked to keep us entertained. She has been at many of our do's and is a fabulous act to see. We have prize raffles, bingo and much more! I really am proud of my roots and where I come from. I’m a true Geordie lass as I was born in the heart of Newcastle, I love living in the North East of England and personally wouldn’t want to live anywhere else. Apart from everyone being so friendly here I think we have the best coastlines ever as well as the best countryside and also the most spectacular places to see and visit. I love going to Newcastle as I am an outdoor person and love being in the openness and fresh air. I get a great buzz being amongst so many people and love to hear others enjoying themselves. I sometimes can’t help and have a bit chuckle to myself when I hear some of the conversations and when I do hear people laugh and carry on it makes me feel happy to and pleased to be alive and part of it. I also love the many different smells and like listening to the buskers and actors on the streets, for me I think it does bring something extra special to the city even if they sound good or bad it doesn’t really matter. Although I still enjoy shopping in Newcastle it is now so different from the place it used to be and the one that I knew. There have been lots of changes over the years as many buildings have disappeared, bus stations and picture houses have gone as well as many of the old big brand stores such as C&A, Littlewoods, BHS, Woolworths, Binns and many others which is so sad. I never thought for one minute that it would happen in my lifetime as I grew up with them all and somehow you think they are going to be around forever. There are still many great buildings and places to see in the city of Newcastle as we have a lot of history here. Apart from our famous St James football ground there are beautiful churches, museums, theatres, music venues, our historic one 182 year old indoor Grainger market as well as our beautiful hotels, bridges and our famous quayside. People are not just travelling from around the country to come and celebrate their hen dos, stag nights and other events here, but Newcastle and especially the quayside have now become so popular and well known that people are now travelling from all over the world to come and celebrate their special events here together with their families and friends. But of course the biggest event which is held here each year is the great north run which has certainly put Newcastle on the map. It is the most spectacular event of all to be held here in Newcastle where thousands and thousands of people gather from all over the globe and from all walks of life to help raise funds for many charities and worthy causes. I’ve never been brave enough to take part myself which I do feel very guilty about but who knows, one day I might just surprise myself and everybody else and do it. So now you know why I’m proud of where I’m from. 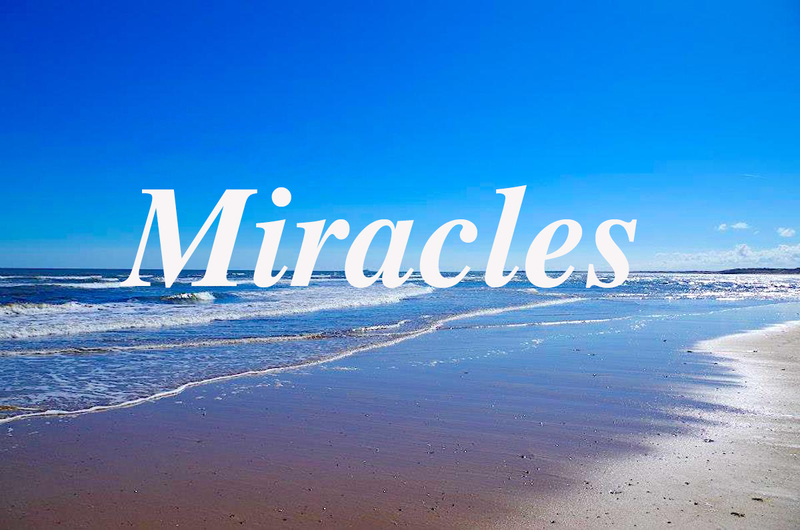 For years I never believed in God let alone miracles, it wasn’t until 1983 I witnessed my first when my husband Raymond was knocked over by a car. On arrival the ambulance men thought Raymond was dead and a blanket was put over him, shortly afterwards somehow another ambulance driver realised he was still alive but only just. 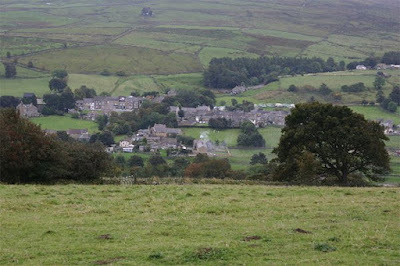 Consultants at the hospital never expected Raymond to survive as his injuries were horrific, the worst that they had seen in years but to their amazement Raymond proved everyone wrong. His journey to recovery was a long one as his injuries were multiple including brain damage. For me that was the least of my worries, the most important thing was that he was alive and still here with us. I knew in my heart that it was God and his archangels who intervened and saved Raymond for me. I strongly believe that your life is planned out for you and if God had wanted to take Raymond to be with him, he could have quite easily of done it there and then. Sometimes things do happen in our lives of which are way beyond our understanding but somehow I knew there was a purpose as to why Raymond had been spared though I didn’t fully understand the reason why until God revealed everything to me some years later. There is no doubt in my mind that God does exist and that he can and does perform miracles, I believe it can happen to anyone at any time he chooses whether we believe in him or not. From the age of seven my life was turned upside down and I was left broken hearted. I felt everything that was good in my life had been taken away from me and I blamed God for all of it. My Mam left my Dad and she took me, my twin brother and my older sister away with her to live with a new family and a new father. Shortly afterwards my Nana Gardner who I truly loved and adored suddenly passed away. I felt my whole world as I knew it had come to an end, I hadn’t just lost my home and family but also my school and all of my friends. I had never felt so desperate, unhappy, unloved and so alone, it was as if I didn’t belong or matter to anyone including God. As time went by my life continued to go from bad to worse simply because of the amount of abuse I was suffering from all angles. Looking back I never realised just how ill I was and how much my life had been greatly affected until everything came to ahead at the age of sixteen when I became mentally ill and had a massive breakdown. I eventually ended up in a secure mental institution. My experience there was so horrendous that it will live with me forever. 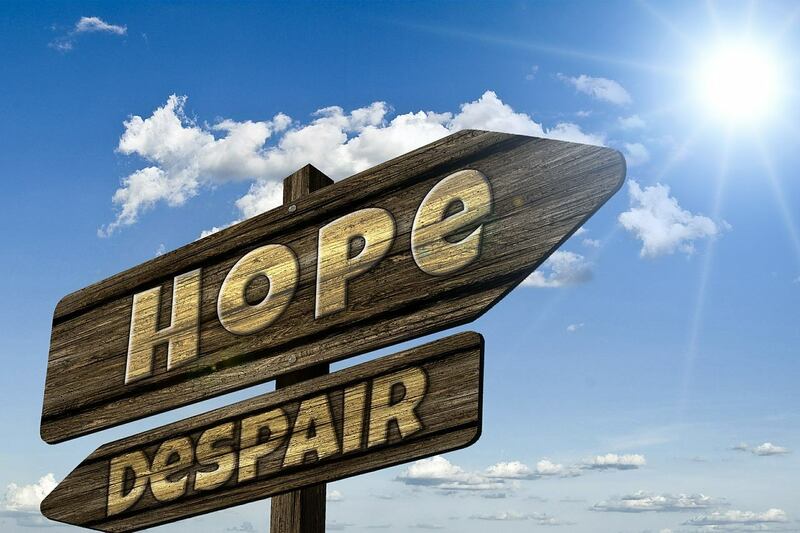 I think it is true to say whether we believe in God or not that he is the main guy that most of us turn to when we are faced with the most difficult and traumatic times in our lives. I know I did. If you are in a bad and dark place at this moment in time and think that there is no way out, please believe me when I say that there is as I am living proof. There were many times in my life when I wanted to give up and hoped and prayed that I wouldn’t wake up in the morning. Many years have now passed and when I look back I still can’t quite believe all I have achieved, remember that you can to if you put your mind to it as everything in life is possible. Stay away from those who are full of negativity as it will only play with your head and bring you down and make you feel much worse within yourself. I can’t express enough how important it is to mix and be with those who think and act positive as it will have a much profound and greater impact on your life. By having faith, hope and love in my life now it makes me want to carry on no matter how bad things may seem, never give up on yourself, live your life to the full and cherish every moment especially with those who you love as we don’t know what tomorrow may bring. God bless and take care of yourself. You can read more about my life and how I overcame adversity in my book Blind Courage. Sorry if I have missed anyone out, you all help us so much and your donations and help mean we can provide families this much needed facilities and support during such a difficult time. You really are all "Super Stars" and make a difference to so many lives. Want to learn more about Blind Courage the book? This remarkable story will not only make you laugh and cry but will also inspire those who are in deep despair and struggling through life by transforming and giving them hope for the future. She is also founder of the well known local non profit making charitable organisation Emmanuel House for people affected by cancer. If you would like to read more about my work with Emmanuel House just click the link below. 2016 © EmmanuelHouse. Ethereal theme. Theme images by konradlew. Powered by Blogger.